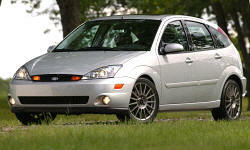 Why the 2002 Ford Focus? 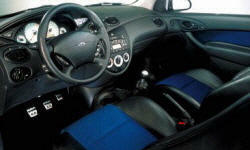 The 2002 Focus Zetec has been relatively reliable - however, one nice thing is that almost everything that has failed on it has been fairly inexpensive and a well known issue - i.e. The themostat housing, the ignition coil module, the transmission speed sensor, the alternator, the radiator fan resistor. Hard to categorize, but I didn't put a lot of thought into the 2002 Focus when I bought it. I needed a new car and it was about the smallest and least expensive car that Ford made. Now it is 12-years old and I am considering replacing it, and there aren't many cars out there that I like better - which says a lot for it. The timing belt on the Zetec is not a chain, but it only has to be replace at 120K mile intervals. Also - it is a non-interference engine, so even if it fails, it won't damage the valvetrain. Why Not the 2002 Ford Focus? The climate control is somewhat poorly implemented. The heating and HVAC does fine, but if you don't have re-circulation on, all the exterior smells get into the cabin. If you do have re-circulation on, the windows quickly fog up. Also - re-circulation is turned off if you select defrost - even though on previous Honda's it could not be turned off if you selected defrost. The temperature gauge is inaccurate and the cooling system is weak. I use an Ultraguage with it. The thermostat housing is a well-known problem as is the cooling fan relay. Even with those working temperature will fluctuate between 200 and 235-degrees F, which seems high to me. Never caused any issues and never stays above 220 F for long, though. However, the temperature gauge never goes beyond thet mid-point, even though I can see the engine temp is over 230 and can smell a hint of antifreeze cooking off. This is probably true of most cars, but you have to be careful with replacement parts for the Focus. In some cases (motor mounts, coil modules), the replacement parts are clearly inferior and you are better off buying genuine Motorcraft. In some cases (serpentine belt tensioner), the Motorcraft design is not that good and aftermarket parts are better. In some cases (alternator, starter), the aftermarket (non-Motorcraft) parts are not as good, but the much lower cost and lifetime warranty makes them a good option even if they don't last as long.